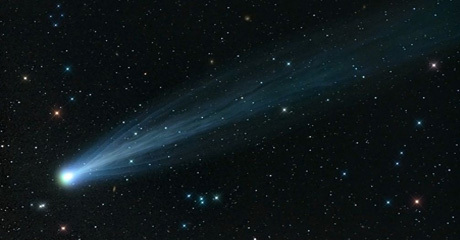 The comet ISON is approaching the sun from the farthest edge of the solar system, with its closest pass predicted for November 28. Planetary scientists and astrophysicists have known this blob of dust and ice has been traveling toward the sun for more than a year. They also know that ISON has been on its way to an encounter with the sun for a few billion years. As ISON makes a pass around the sun, scientists will observe its course to see how it behaves. If the comet disintegrates in the sun’s heat and gravity, it will emit dust and gases that will leave identifiable chemical signatures. Material from comets provides building blocks for planets, and Comet ISON should advance scientific understanding of the earliest years of the solar system. ISON is “a dinosaur bone” from the birth of the solar system, said Carey Lisse at the Johns Hopkins Applied Physics Laboratory. If it is not burned up or broken apart by the powerful heat and radiation of the sun, ISON may become visible again from Earth the first or second week of December, Lisse said. Would-be observers should be on the lookout just after sunset or just before dawn where the sun meets the horizon. Space-based observation platforms have been trained on ISON since first detection of its sun-bound course in 2012. As it continues its closest pass-by, scientists have the opportunity to accumulate the greatest body of observations ever collected on a single comet.